If you know very little about Granada Spain this text should answer most of your basic questions. It was written by an Englishman who has lived in Granada for more than 25 years. 250-350,000 depending on the source. Maybe the wild fluctuation is due to Granada being a student city with a large amount of people coming from outside to study. In January there are lots of blue skies and it is warm when the sun is shining but it gets cold at night. There are occasional frosts. 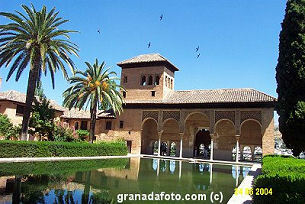 The best time to visit Granada is in the Spring and Autumn when the temperature is just perfect with warm sunny days. During July and August it can be very hot and some days the temperature reaches 40C. Granada has a dry heat which is much more bearable than the humid heat which you will find in Barcelona. There is very little rainfall although every few years there are spells when it rains very heavily. For average temperature and rainfall statistics click here. Spain is generally very monocultural in comparison to most of the other developed countries. During the years of Franco there was very little immigration and 95% of the population are white Catholics. For centuries Spain was host to Arabic culture and this has left many strong imprints both genetically and culturally. The "granadainos" don't have a particularly good reputation and they are renown for their "mala follar" which as far as I understand means cantankerousness or bad humour. There is some truth in this, and I would say that the granadinos are less friendly and lighthearted than the average Spaniard (but that still means that they are more friendly than the English). 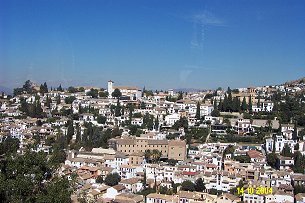 Granada is located just at the point where the Sierra Nevada mountains meet the fertile plain of the vega. Behind it are steep mountains and in front there is flat agricultural land. I suppose it was first inhabited and grew because it was easy to defend from behind and although it is dry in the summer there is always a supply of water coming from the mountain fuelled by melting snow, the rich soil in the Vega provided an ample food source. The altitude is 630 metres. Granada has its usual quotient of churches, museums etc. typical for a southern European city. 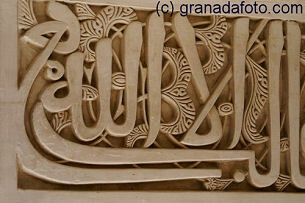 However, Granada has the Alhambra which is considered by some to be one of the 10 wonders of the world. In case you don't know, the Alhambra is a massive castle constructed over many centuries. It consists of gardens, fortifications and sumptuous palaces. It was the home of many of the Arab Sultans who ruled the whole province so I suppose for centuries it received the optimum in interior decoration and architecture. If you read the Koran, it continually repeats the idea that heaven is a garden with running water. From this perspective you could say that the Alhambra is an Arabic attempt to create heaven on earth. Nowadays, two million people visit the palaces each year and 8,500 people visit the Alhambra every day. It is therefore Spain's most visited monument. Even the biggest philistine would be impressed. Click for a panoramic view (290 kb). The Albaicín is the old Arabic quarter located on the hill opposite the Alhambra. It is characterised by cobble stoned streets with white washed houses. Despite several centuries of neglect and architectural barbarities allowed by the town council it still retains a a strong Arabic feeling (the Arabic population was ethnically cleansed just over 500 years ago). There are many squares with terrazas and places to laze about and have a bite to eat. The Albaicín is an oil painter's paradise and almost at every turn of the head there is an attractive view, almost always involving glimpses of the Alhambra. If you go to a shop which sells any of the typical granadino pottery (white background with strong blue shapes) you will be sure to read the oft quoted refrain: Give him alms woman because there is nothing as bad as being blind in Granada. Go to Mirador de San Nicolás and you will see what they meant (see photo). The English wear bowler hats and read the Times, the Swiss make good watches, wear short leather trousers, climb mountains and yodel, Americans eat hamburgers, are not shy, drive big cars, and talk loud, the typical idea of a Spaniard is of a dark haired fiery gypsy woman dancing flamenco with a red rose clenched between her teeth with a bit of bullfighting going on in the background. All the national stereotypes are based on something and the Sacromonte is one of the places that gave rise to the connection between Spain and Flamenco. 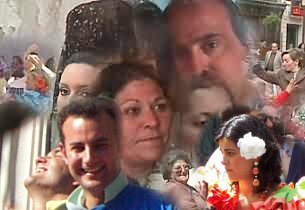 The gypsies arrived about 600 years ago and one of the places where they congregated was in the caves of the Sacromonte. 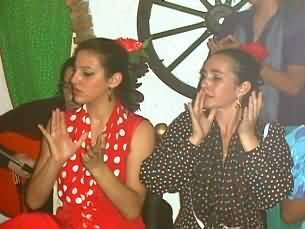 The mixture of Arabic influence combined with the particular lifestyle and temperament of the gypsies created Flamenco. If you read any of the tourist guides to Granada they will tell you that the Sacromonte is a tourist trap, inviting gullible tourists to see second rate Flamenco performances washed down with watered red wine. Maybe that was true a few years ago but nowadays it's not too bad. Even Bill Clinton went to one when he came. There is no point in buying a ticket off someone in the street. Just go there yourself. You can buy a ticket in your hotel and they will pick you up in a minibus. When I lived in the Sacromonte I regularly got swamped in the street by 60 northern European purple rinse grannies as they got out of the bus on the way to see the Flamenco. 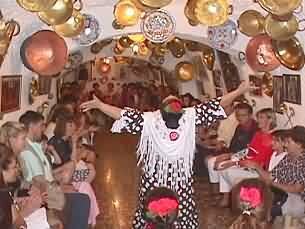 People ask me which is the best Tablao (Flamenco gypsy cave). I am not an expert nor a flamenco fan, I liked the Rocío because they dance right in front of you as they go up and down the cave. Most of the others have a stage which is less intimate. The best one nowadays is at the Museo run by Enrique Canastera. If you want to stay in the Sacromonte stay here. Granada is the opposite of most cities in that in the holidays it is much quieter than at other times. The reason for this is that the students go home to their pueblos and in the summer many people go to the beach. All Spanish cities have a vibrant nightlife usually involving consuming copious quantities of cubatas (spirits mixed with a long drink) and staying up late, Granada is no exception. I am English where the whole nation has to go home (or go for a curry) at 11pm when the publican rings the bell. So when I first came to Spain I was naturally enthralled at my new freedom. Although it is becoming more indistinct, there are two main zones full of bars. Pedro Alarcón attracts a generally younger set of people 18-22 and the area around Plaza Nueva and the Calle Elvira maybe a bit older. In the winter there are often bands playing in the bars, the best way to find out what is going on is to go to bars and look at the posters on the wall, ( a good place to find posters is the Pata Palo behind the Gobierno Civil on the Gran Vía) or go by word of mouth. There used to be a lot of jazz and blues but music in bars is becoming less common because the authorities are more strict about noise levels and complaints by the neighbours than before. There is a lot of Jazz and Flamenco at the Eshavira in the Calle Elvira. From the time historical records began Granada was ruled by many Caliphs, Arabic sultans and dynasties. The Arabic/Moslem empire once stretched right up into the north of Spain. The various Christian groups settled their differences, joined together and steadily drove the Arabs out of Spain. Granada was the last stronghold and finally succumbed to Isabel and Ferdinand (the catholic monarchs) in 1492. The Moslems and the Jews were forced to leave the country or convert to Christianity. A period of what would nowadays be described as ethnic cleansing ensued. At the same time Christopher Columbus came to Granada to ask Isabel and Ferdinand for a grant to build ships so that he could conquer the Americas. They gave him the money and I am sure you already know the rest. Probably the most famous granadino is the well known playwright and author Garcia Lorca. He is reputed to be one of the best writers this century. What makes him even more memorable is the fact that during the bloody Spanish civil war 1936-39 he was taken to a village near Granada and shot by a firing squad. Granada is located next to the Sierra Nevada mountains in Andalusia in the south of Spain. It is about 70km from the coast. Being in this position means that it is possible to go skiing and sunbathe on the beach in the same day.